This month I have been exploring the ancestral and rare breed wool and fleece of many of the Celtic and Viking lands such as the Shetland Islands, Soay, a tiny island off the Isle of Skye in Scotland, Leader Sheep from Iceland. What a great adventure to take with the masculine medicine doll and his seafaring ways. Interestingly as I began to work with these figures I was drawn back to working with raw fleece and found a bag of fleece from a friend of my father's in Tasmania that was perfect for hair and beards and rugged woollen shawls. These masculine medicine dolls have also been very popular with our clients, some going to families to represent grandfathers and fathers - I love the idea too of dolls that can assist young boys to feel strong and grounded in their lives. These dolls gave me such a gift of stability and energy as I was creating them. They have all found homes now and I look forward to hearing about the adventures they inspire. I feel like this is an adventure that may keep calling to me for a long time. It is a curious thing that the more medicine dolls I create, the more I learn about myself and the more I want to learn about the stories of my ancestors. These stories of our lineage are important - every life matters. I am especially drawn to the lives of those who were treated as if they didn't matter - what if a small woollen doll can help to change that somehow? Perhaps just in acknowledgement or speaking their name we can begin to uncover and connect, see them as they truly are again. We can become the Storykeepers, the TruthTellers of our own history and the histories of others. Most importantly we can give these forgotten and ghosted people a small gift - a doll to comfort them or to sit with them. This, somehow gives me comfort too. There is a growing interest and passion for ancestral medicine and uncovering ancestry. I see that this is the work of StoryKeepers in the family. My sister Belinda is one too and she has been doing a huge amount of research into our family tree. I think it's important to tend carefully to the bones of our ancestors and to give them privacy when they ask too - not every book wants to be opened. In these times I just send love. I don't need to know the whole story. But even the saddest stories in our families can be a source of strength when we acknowledge the level of hardship they lived through and the resilience and humour with which they faced it! That spirit is very needed by us right now. In difficult times it's important to engage in something practical and real that can give you a sense of purpose amid the chaos of life. For me, it has been making medicine dolls for the lost, the ghosted, the persecuted. At the moment I am weaving dolls that will be left at sites in England, Scotland and Ireland when I visit to pay my respects and in a small way provide some love and acknowledgement of injustice. The doll above was created as an offering to the women persecuted as witches in Scotland. She will be left in a small fishing town Pittenweem, another doll will be left at the Witches Well at Edinburgh Castle and I will also leave a doll for my own ancestor, Janet Inglis, a spinner and weaver in Ayreshire. I will also be leaving dolls in Ireland to honour my ancestors and to acknowledge the medicine women there - many who had to go underground to survive. I see all of these dolls as weaving connection and memory and in a way singing a song across the lands and across oceans. Some dolls for the lost and some dolls for family who were never able to afford to return back to their homelands. I see this as a way of rebuilding ancestral trackways, starways, horse tracks...ways to find myself when I am lost and ways for my ancestors to communicate with me when it is needed. This medicine doll, She Who Wears Antlers will be gifted to the women of Dublin to honour the girls that were shamed and blamed and incarcerated in the Magdalene Laundries. She will be given to them in a combined Swan Weaver Ceremony - a meeting of the Black and White Swan medicines to be held with Karen Ward of Sli An Chroi, in Dublin on 15th October. I urge you to check out Karen's amazing work teaching and sharing the mysteries of the indigenous shamanic tradition of Ireland. As I also have ancestors from the city of Dublin this will be such a personal and joyful return. It shows me that we can bring beauty to areas of pain and difficulty and injustice with small, simple acts that hold love and intention. It also helps me to keep connected to stories that are happening everywhere and to remember that we are all in this together. You might remember the Bird Girl doll that I made for the women and children of the Crossbones Graveyard in London. This is the site of a recently discovered medieval pauper's graveyard for the women and children, many of them prostitutes known as the Winchester Geese deemed not worthy of a consecrated burial. Amazing and resilient local people fought to save and honour the site as a place to come and pay respects to the outcast dead and alive. A place for the different, the difficult, and yes the wild. Last week our dear friend and singer, Lisa Mitchell delivered Bird Girl personally to Crossbones and sang the medicine doll into the site - you can just see Bird Girl tucked in on the left side of the statue of the Mother looking after the graveyard. Lisa also sang for us when we held our ceremony for the Magdalene Laundry girls here in Melbourne and recently I found out that the Crossbones we also known as a Magdalene grave. I was so happy to see and hear Lisa sing the doll into her new land and new family of Geese girls with an old bush ballad from Australia written in the 1800s called The Colonial Widow to honour the courageous women who traveled so far to create new lives here. I love that this song is both sad and cheeky! You can hear Kate and Ruth's version of The Colonial Widow here. Thank you Lisa! What a gift you are and what a voice to be sung home on. Here is one of my favourite of Lisa's songs, The Land Beyond the Front Door, sun at the Abbotsford Convent, site of the Magdalene Laundry here in Melbourne. If you would like to make a medicine doll for your ancestors, yourself or to an area in need of healing our next doll workshop will be : Winter Solstice: The Sleeping Trees, Medicine Dolls made of 9 Sacred Trees to be held at Tree of Life in Kew, Melbourne on Saturday 25th June. Book with Julia. I have been receiving so many beautiful stories from medicine doll keepers and I thought I would share some today. Often the real magic and mystery of a particular medicine doll isn't known to me until I hear back from their new mama's and keepers. Sometimes the doll only really wakes up and makes sense when she is finally in their home and their hands. Above is a photo taken by the mother of these two faerie sisters who made a decision to take a wild adventure up to the natural spring at the top of Mt Donna Buang at dusk! on a school night! after their bath! and making them late for their dinner! Good adventures always take at least a little courage and rule-breaking don't they? I love the image of the little girls in the twilight at the spring and seeing the Grandmother doll peeking out through the ferns. "Wild Child Companion... This beauty-full Grandmother Medicine Doll came to me unexpectedly from the hands of @sacredfamiliar two years ago upon the birth of a new moon... She found me swimming in a crocodile river in East Arnhem Land where I was practicing Indigenous Ecology with Ramingining Elders. I remember the moment so vividly... the delicious enveloping cool of the water after unrelenting body-softening heat, filtered sunlight dancing upon the ripples as I moved, the laughter of the children from the outstation, hand-lit fire running happily along the banks as we swam (to keep the crocs at bay!). She carries the wisdom of integrating Indigenous and Western knowings. A perfect synchronicity. She delights, enchants, and comforts the Wild Child in me, and has kindly agreed to be my companion on many rough bush adventures. My heart full of gratitude. And sometimes I receive a request for a medicine doll that feels so big and unknown to me personally but my heart wants to try and help and so I ask the Grandmothers to guide my hands and show me what to do. Last month I created a doll for a young man who has been self-harming, cutting himself. While I don't understand all of the feelings that create this illness I do remember very well the confusion and pain of being a teenager and how hard it was to express myself. I have also experienced this same illness in a family member close to me - while I have no words or advice for something I don't understand personally, this is where I feel a doll can come in and be a bridge between the adults and the child - a comfort and strength when words don't really help anyway. The medicine bundle included snakeskin, ancient fossils of sea flowers, sacred mapacho tobacco from ceremony and mountain ash resin - blood red resin from the tallest and strongest trees in Sherbrooke Forest. And finally the bundle called for moss and I thought about how moss was used not too long ago in many medicine practices to stem the flow of blood, to soothe, to soften... I also heard lots of music as I worked on the Grandfather doll. Guitars - loud! I knew that I had to include a guitar pick somewhere on the doll. When I asked the boy's mother if he had a guitar and pick she could send she was surprised - she said that he used to love the guitar but had packed everything away when another boy had told me he couldn't play well. I went to a guitar shop and bought a new pick for him but when I got home I couldn't find it anywhere and Tony gifted one of his old picks - it had a red back spider on the front of it - the red worn off the spider from so much enjoyment in playing so many songs. I placed the spider pick on the back of the doll under his long hair. When I sent the doll to the young boy's mother she wrote to say how amazed she was - all these things were so significant and personal to him: the beloved guitar given away and being called back, moss that he had been excited to grow as a child and a piece of moss from they have kept from a trip to the mountains a few years ago before this time of difficulty and that one of his fears was of spiders and that having the spider with him would make him even stronger to face the rest of his fears. Perhaps the spider is his shadow totem - an animal that we fear the most often has the biggest teachings for us in facing our fears and reconnecting to courage. When we embrace the shadow totem we actually call back elements and parts of spirit that are needed and this totem becomes a source of power. Each doll I make brings me so much joy. Even when the story is heavy, the doll is not and I love that we are beginning to talk about and share our stories - this is how we heal and remember that we are not alone. Each story is our story as a community and I'm grateful to Tania, Dawn, Nymh and this young man's mother for sharing their stories and their hearts. Late last year I received a request from a beautiful Mexican family to create a medicine to hold the ashes of their beloved mother and grandmother, Adelina. I was very happy to create this doll for Daisy, Adelina's daughter who I had come to know through her sister-in-law, Dawn, another beautiful soul who has gifted us with many beaded Huichol treasures for our dolls over the last year. And so I knew that Daisy's dear mother was dying and how much this was a sacred time for her, how she took on the role as carer and wise guardian to walk her mother through the threshold of death and rebirth of her spirit. I was also honoured to be invited into this family and their beautiful Mexican ancestry and wisdom in honouring of the dead. Yesterday it was my birthday and today in America where Daisy lives and Mexico where Adelina was born it is still February 15th. The link between birth and death is so strong, if felt like the right time to write this story. I knew that one day, I would be asked to make a doll to such as this. But when it finally arrived I began to get nervous - what if this was too big a job for my skills? Could I really do this? I took this request on with love but also a lot of deep breathing. I don't have anyone around me to teach me to do this, I thought but then I've always felt the presence of my own grandmother and ancient grandmother spirits when I work and so I just had to trust that they would show me the way. One night I had a dream of running a little store selling all kinds of medicine tools and talismans. At the end of the day it was time to close up and as I was busy rushing around a small group of men dressed in white with embroidery on their shirts began to come and sit in a small circle in the middle of my shop. But I was busy, I had so many things to remember to do to make the shop run well and to close up properly. The men began to chant in a language that I didn't recognise. They began to sing medicine songs. Under a table I noticed a small package of bones. I was so drawn to what the medicine singers were doing and singing but I kept thinking that I didn't have time to stop, I had to lock up the shop. When I woke up the next morning I knew that these men where either Adelina's ancestors or spirit singers guarding and watching over her and that they were getting frustrated with me for making myself busy with all of my other jobs and avoiding the deep medicine work of creating this doll for Adelina's family. I felt ashamed because they were right! I should have sat with them and listened to their songs, I realised the bones in the dream were a symbol of the sacred ashes I held on my table. I realised I could wait any longer to be ready or know more to begin - I just had to stop running around and start! I began by making a medicine shawl from a piece of felt gifted to me that was hand dyed with seaweed. I started to see stars and cosmic spirals. I used fibres that were dyed with flowers and I started to feel more and more confident about my own role in being the hands for the grandmothers to do their work. Each night I kept seeing the vastness of the cosmos and I remembered a boulder opal that reminded me of this feeling that I had been keeping for a special doll. At the same time I received hand blown glass bones adorned with flowers and the doll began to form very quickly. As she was forming in front of my eyes I began to feel such affection and love for Adelina and for her daughter Daisy for all of her trust. One night I worked very late until it was almost dawn. As I worked I felt the air become thick around me and I felt airy movements near my shoulders and arms and it felt like butterflies flying all around the room, all around me. I also heard a strong and clear message to 'look at the date'. I felt it was a message to look at the date of when Adelina had passed from this world and I looked and found a remembrance photo posted by Daisy. When I looked at this photo I couldn't believe it - Adelina and I shared the same birthday. She too had been born on February 15th. It was not the date of death that she wanted remembered by the date of birth. Rebirth! It felt like a big hug, like we were connected in this small way. Each day I felt Adelina's urgency now to have this doll completed to be a source of comfort to her daughter. The last element was a Monarch butterfly placed on the doll's hand to honour the late night visitors to my doll workshop and perhaps one of Adelina's spirit animals. When I mentioned this to Dawn she said this was significant and that in Spanish the word for butterfly is Mariposa. I knew the medicine had her name now: Adelina's Mariposa - a light spirit to hold the ashes of this beloved mother and grandmother and guardian to watch over and guide her family through their grief and eventually to a place of peace. After I had sent the doll carrying the sacred ashes across the oceans to be with Daisy where she belonged, I found a photo of Daisy taken beside the altars in Mexico celebrating ancestors on Dia de los Muertos (Day of the Dead). I was stunned and happy to see that Daisy was wearing a Monarch Mariposa in her crown of flowers. There really are no accidents. So many more weavings and synchronicities occurred during the making of this most sacred of medicine dolls, Adelina's Mariposa. I was changed after making this doll. I realised that this work is very precious to me and that I could do this work more. I also found that I was dedicating myself in a deeper way now to the practice of medicine doll making and to never forget that the ancestors are always watching, helping and if needed singing in our dreams. Death is one of our biggest teachers. We cannot turn away or hide from this great mystery and yes it is confronting but also incredibly beautiful. I believe that death teaches us about what is truly important and how to love even more deeply. I send the deepest love and respect to Daisy and Dawn and their combined families. May this precious doll be an anchor to hold you through your grief and give you wings to lift your heart to love again. I thank Daisy for this honour and permission to share her story and for sharing the gentle and beautiful spirit of your mother, Adelina with us all. Happy birthday Adelina. How many of our own ancestors have been labelled as outcast? How many of us feel this label even now? Not too long ago, it was very easy for a woman to be made outcast and the energy and fear of being outcast for women even now, is huge. Very often all you have to do is rebel against the conventions of society to be labelled as a threat. It is especially strong when we break society's rules around sexuality - the ultimate 'original sin' for women. All of this is presented to me daily in my work with swan blessing as I work with clients to bring healing and acknowledgement to their lineage and at the same time become aware of and clear old beliefs of the pas. But then all I have to do is turn on the television to see all of these old beliefs and shaming ways are still presented to us as normal by our media and governments. I won't lie, it troubles me. Sometimes it depresses me. But over the years I have found a way that helps me to make peace with the present and the past - to make offerings to the outcast dead. I often leave medicine dolls at natural places of great beauty - mountains and springs. But I have also begun leaving and sending dolls to places where ugly things have happened in the past. I believe that by sending our love and healing to these dark places we can re-enchant the earth and the bones of our ancestors. In Melbourne, Australia I focussed much of this work on trying to heal and acknowledge the spirits of the women and children who were incarcerated in the Magdalene Laundries for being wild and 'fallen women' (usually meaning pregnant). A girl could find herself in this institution just for being too free-thinking, running away from home or even because she was simply already an orphan - can you imagine being punished again for being without family? Those girls were locked up until until they were women and made to work in the laundries without pay. This was done to women over a century ago and was continued right up until the 1970's. And so I am writing not only about the dead but about the many, many women who are still living with the memories of these institutions RIGHT NOW. I for one could have very easily have found myself in a similar place. I was just lucky enough to be born a little later, not much later but enough to have left home as a teenager and been left alone to make my own way. I believe the story of these incarcerations for being 'fallen women' are all our stories. We are all touched by them in some way or another - they live in us too. I have been very moved and educated about the truth behind these practices by a talented and incredibly brave Australian artist, Rachael Romero who was incarcerated in the Magdalene Laundries at the Covent of the Good Shepherd in South Australia in the 1970s. Her work rips at my heart and makes me cry but inevitable tells me the truth and this helps me to be stronger. To stand up and want to do something about it. I have worked with living survivors but most of all I work with the spirits of these women and children. I am very passionate about letting those spirits know that they are not worthless or unloved or unwelcome as they had been told. I wanted them to know that we remember them, that we love them and that they have ancestors waiting for them too. I shared this work in a public way finally in 2013. It took all my courage to stop doing this work silently and I'm so glad I did because many of my sisters with such beautiful big medicine came to assist me. You can read more about this work I called Femmina Unbound at the Magdalene Laundries here in Abbotsford Convent in Melbourne. I have always had a desire to help find and bring home the lost. Lost spirits and lost parts of our own spirits. The doll you see below is called BirdGirl of the Shetland Islands and she has the spirit of an owl - a night-time creature known for her wisdom and insight, and she is dressed in fibres from the Shetland Islands that beautiful wild Scottish land and pure Australian merino wool. She has a hand blown glass bone that sits over her heart and a quartz crystal with blood red inclusions over her womb. And so now I come full circle back to work with the spirits of the Outcast Dead. She was created for the women and children, the wild 'Geese' of the Crossbones Graveyard in London. I became aware of this graveyard 3 years ago as I was preparing to hold the ceremony for the girls of the Magdalene Laundries. The spirits of the Geese were speaking to me within the same group of the Magdalenes. Sometimes, when Tony is asked to come out to do a clearing on someone or to clear spirit attachment from their home, it is not the person or building that is ‘haunted’ or unhappy, it is the land itself. The land carries histories of human life beyond what we can see with our eyes and much further back in time than the current residents can remember. This is when Tony is called to speak with the spirits of the earth and to clear and honour the traumatic events that have happened there so that the current tenants can live in harmony and peace. In our current culture we have not been taught to understand that we are residing on a living organism – the body of the Earth. Just as we carry emotional and physical scars long after a traumatic event, the spirit of the land also carries energetic wounds. We have found that very often what is required is an honouring of the event and the souls that were involved, quite simply, what is needed is for us to acknowledge and remember. I am over the moon to find a sister like Jacqueline - in the first photo I ever saw of her she was holding a Swan smudging fan outside the gates of the Cross Bones Graveyard - I really couldn't believe it - so many synchronicities between us. Sometimes we can feel so alone in our work, like we are scrambling around in the dark and then you find a sister on the other side of the world doing very similar work. I'd love to see a similar permanent place of honouring and love at the gates of the Magdalene Laundries where we can come and leave tributes and remember and sing for them too.I am sending the BirdGirl to a dear friend who will meet with Jacqueline to sing as she gifts the doll to the spirits of the wild Geese and sing over the bones of the graveyard. In a way she will be a part of me there until I can make it in person later this year. I am excited to be doing this work and planning a new ancestral trip with Tony to visit Scotland and England. We hope to share Swan Blessing work with our sisters and brothers across the ocean and also hold medicine doll workshops too. A singing over the bones journey to our ancestors or the 'caves and graves tour' as I keep telling Tony.Here is a link to the Cross Bones Facebook page where you can join in vigils and events and if you are in London you should pop in. I share this today to hopefully inspire you to make small acts of your own, offerings of love and acknowledgement to our ancestors especially those who were told they were outcast. In our small ways we can call them back into the circle of our lineage. The healing is for us all. MoonMedicine for this month is Butterfly Medicine. As I dreamt with the butterfly medicine I became aware of how much we are living from our minds instead of letting the mind be guided by our soul or psyche (Butterfly). And let me say, I really love the MIND! I really do. I just think we use it for everything, including our dreaming and that changes the dreaming to planning or wanting or worrying. To dream and really dream we must feel free and open and expansive. This is why our sleep is so important - very often it's the only time the mind is resting. I believe the mind is best used as a powerful tool to research and plan with once the dream is known. Is your dream known to you? My guess would be that at this point in time, especially after the very big shakeup we have been given astrologically over the last 3 years, you will have a sense of what you wish for yourself, your community and Mother Earth. Sometimes trying to hold a dream for the earth can feel really hard and so I always come back to the 'little' because the medicine dolls have taught me: 'the little is the big'. When we hold a new dream for ourselves of becoming whole, this ripples out and affects everything and everyone around us and that ripples out and ripples out... Even if the insight into the new dream has been gained by seeing events we don't want to create playing out in our present, this too is a gift. Sometimes it's very helpful to know what we don't want, to create the new dream. The key is to let go of the fears once we understand what the new dream is and wants from us. Hmmmm and this is where it gets tricky doesn't it? I want to share two powerful examples of butterfly medicine here that have helped me so much over the last couple of weeks. The first is channeled wisdom from Lena Stevens shared on the Mystic Mamma website about the energy of this time creating stress and pressure that cracks the butterfly's chrysalis and most importantly why this is happening - because your dreams are working! And the second jewel was passed along to me by our dear friends in Ireland, Karen and John from Sli An Chroi . It is one of the most amazing performances I've witnessed in a long time. I felt it in every cell. I love it so much! Irish poet, Venus CuMara has dedicated her life to She, to the Mother of all Mothers and in this earth shattering piece delivers a loving and unstoppable message from Kali to the Butterfly. Whoah! It's all coming through the poets at the moment isn't it? I feel like we are finally listening to the poets again and I'm so happy and to have Venus CuMara's golden voice in my medicine bag as I step out of the cracked cocoon. I feel like so much of what we are experiencing right now is already preparing us for next year and beyond. I get a sense that Butterfly will be with us for much longer than this month, perhaps it will be a totem for the whole of next year, an embodiment of the spirit of New Dreams and New Wings. But how do the new wings form? What dreams are building your new wings? What do you have to leave before you can try them out? On the morning of the Full Moon last week I walked to the post office to pick up a parcel from my Dad. Inside was the enormous smokey quartz crystal you see above found on his friend's farm in Tasmania. They were digging a new track when this dark beauty was brought to light. Smokey quartz found in Tasmania is often very very dark but like all dark things when it's held to the light, you can see it is filled with chambers of brightness and caverns of colour. At the top corner of the stone you can see a yellow cavern - it is holding pieces of gold. Down the centre is a large cut where the stone was first hit - the cracking of the cocoon. My cocoon is cracking too. I am awake and now cannot stay as I have been for the last 3 years in the forest. I had begun to presume that this was now my life - I would be a dollmaker living in the forest. I loved the simplicity and the unhurried feel to that dream. I liked the idea of being left alone to create for hours and hours and hours...and hours and hours and hours. This cocoon of creativity and very little contact with people in the outside world was beautiful and needed - for a time. What I'm being shown in the new dream is that it's time to integrate the work of dollmaking with the Swan. There is a calling to travel and create medicine dolls with different plants in different lands and to experience the ancestral spirit there. I am very excited about this already dreaming dolls to be created in the Redwoods again next year, Scotland and Cornwall...and the ceremonies that will be held for the ancestral tracks and migration lines between Britain and Europe and Australia. I have been shown how these tracks are in need of love and tending and that by doing this work we will be bringing more peace to our ancestors and indigenous tribes of the land. My ancestry like many Australians is made up of Aboriginal, Irish, Scottish and English grandmothers and grandfathers. I would personally like to bring peace to this ancestral weaving and I am passionate about providing circle and ceremony for others to do this work in their own family constellations. In fairytales there is often a point when a magical person like the fairy godmother arrives and everything begins to shift and change - to dream. When I was young I loved to listen to recorded fairytales on little vinyl records that I would play over and over. I remember this moment of arrival of the fairy godmother or the witch or the wise sage was heralded by the sound of a bell or a harp. Just that sound told me that change and transformation was near. I believe that this repetitive and yes obsessive listening and engagement with oral storytelling was my wise child self practicing the art of active dreaming, vision-making and journeying. I have no doubt that the power of storytelling and significantly oral storytelling developed my mind's eye - I was tending to the ancestral track of the ancient dreamers and they in return shared their gifts. Very soon I could dream awake - look into trees, rock pools, oceans and begin to 'see'. It is how I see a medicine doll before she is made. I thought everyone saw like this but soon found I was wrong. I realised that many of the people around me had no access to vision, were either afraid to open their third eye or chose not to believe in it at all. The Swan, particularly the Black Swan, the bird of the land of my birth, is like a fairy godmother. She heralds the dreaming, the magical threshold, she acts as a trusted guide or psychopomp to the realms of the ancestors. This is not my medicine but our medicine. We are dreamers. We all have our own individual way of dreaming and also our own totems that assist us in our journeys but we are dreamers in a huge weaving - we are dreaming as a collective. And so even though I resisted leaving my forest hermitage at first! I now understand how important it is to be gathering together to dream in community and to share those dreams. When I sit in a dream circle I am aware that each dream is all our dream. That the lessons and teachings are a gift for us all. And the Black Swan wants to bring more of the dreaming of our faraway brothers and sisters together. We will be opening the first of the Swan Blessing ceremonies in Melbourne in February, and travelling with the swan to return to Spirit Weavers Gathering in the Redwoods in California in June 2016 and also returning to Scotland, Ireland and to England in October 2016. Three years ago at Seven Sisters Festival I shared Swan Blessing and spoke to the women before we journeyed about the Welsh word 'Hiraeth'. This ancient word has no exact English match but when I explained it as a sadness, a homesickness for ancestors and ancestral lands and even times that no longer exist there was a huge surge of energy in the crowd. This Welsh word was describing what so many of us were carrying in our hearts - a longing for a time of connectedness through ritual and ceremony and communication with our ancestors. I believe that dreaming is the key to unlocking our own sense of hiraeth. By actively dreaming and developing practice of dreaming at night whilst sleeping as well as active dreaming in journeying circles with community we are rebuilding and tending to the ancestral trackways. The more we engage, believe in and then act on the messages and visions we receive in our dreaming the more these trackways will become whole and strong again. There is no need for us to feel so lonely and adrift from our ancestral medicine - it is right there waiting for us to return, retrieve and use in our world now. Dreaming is our birthright. Knowing that the Swan was waiting for me to journey with her again I travelled back to our old home in Williamstown and the swan sanctuary at Shelley Beach where the medicine of Swan Blessing was first passed to me. The black swans were there in a shallow lagoon and my hope was that I would find just 2 swan feathers - even that can be very difficult to achieve. That day the tide was right out and Tony and I stepped onto a beach covered in swan feathers. Last week on the full moon I returned to the swans again and this time was greeted by 3 swans who made a beeline for me. One swan came right up out of the water to display all of his feathers, including the white feathers underneath his wings (you can see him in the image below). How many times do we live and die and live again in this life? I think it is a constant cycle of living, resting in the cocoon until the new dream forms and leaving the cracked cocoon when it is time to live again. And so I encourage you to have faith in your dream and and your new wings and if you need an extra push just listen to Venus CuMara and her enchanting call to the wild and the free. I am so excited to sit with my sisters and brothers and hear the stories of their own dreaming. I would offer one piece of advice - commit to your dreaming. As soon as I committed to the new dream to travel with the Swan I began to hear from other Swan Sisters from all around the world. I was surprised to discover we share so much similar medicine and dreaming after feeling like I was holding my own dream in the forest. We are many! If I had known this could happen in such a short time I would not have believed it, but that is the magic that awaits when we commit to opening the wings that we have been so lovingly growing. We are awake. A handblown glass vessel to catch tears. RavenKeeper of Secrets travels with her mama, a healer working with women & children in shelters and halfway houses. She is doll for them to tell their stories to when they are not ready or able to speak to anyone else. In May this year I travelled to the Redwoods in California to share medicine dollmaking at Spirit Weavers Gathering. It was a beautiful experience to sit with sisters so far from my home in Australia and humbling too when I heard their stories about the deep and passionate work they are committed to doing. I especially loved catching up with sisters that previously I'd only spoken to online. Once of these women was Heidi Lafinier who I knew as Pura Vida Living and I was so happy when she sat beside me in one of our medicine doll circles. As we began Heidi mentioned that she had noticed how many of my dolls had braided hair and I told her it wasn't conscious it just felt right. She told me that in her Native American Cree tradition, braiding your hair was a way to preserve energy for yourself. To keep it strong and pure. She said just putting a small braid in your hair can help you from being affected by the energy of others - keeping your spirit close so you can work with other people who may be in pain and trauma and not have their energy affect you so much. I was very grateful to learn this and it really seemed to speak to the similar medicine of wool as an insulator, incubator, a holder of energy. Wool also is one of the few fibres that does not easily take in water - just like our hair. "I have volunteered at the battered women's shelter and a halfway house for women just released from prison to perform Reiki. I always take Bold and keep her with me, but on one occasion at the women's shelter a red haired little girl asked if she could hold Bold while I gave her mom Reiki, I saw no harm in this. As her mom and I walked back into the room we overheard this: "And that's really how my arm was broken, thanks Bold I will tell the Police the truth now. I love you too!" She gave me Bold and we went home. Bold didn't talk to me on the way home or at work the next day but I was busy and let it go, but after work we were off to the halfway house. These women are very hard or hardened. I offered Reiki to one woman and another asked about the doll I kind of explained her and tried to hurry on, every red flag in my body said keep moving, she was someone I'd been warned about (hard, mean, hateful, violent etc.). But she said "I would like to talk to that doll while you do hanky panky to her" and she pointed to the other women. I really did not want to give Bold to her, but Bold still wasn't really talking to me, so I handed Bold to her and I finished Reiki and rushed out to get Bold and it was like a different lady handed me back my doll. And these are her exact words: "That is some doll, first person who ever believed me, and I have been telling the truth for 35 years" and she turned around and walked away. I stood there like an idiot. On the way home Bold still didn't talk but that night I decided I should sage and cleanse her, but she spoke loudly then and said maybe you should meditate with me first! Then she didn't betray any confidences but she let me see that she was not made to be a 'Keeper of Secrets' she was there for me and she would always help me, but it was hard on her to take the pain of those she did not know, pain that was so indescribable she could not share with me. Because she was my keeper. So I helped cleanse her and we are whole again. So I now Know, I need a medicine doll whose sole purpose is to be strong as steel, who can be the 'KEEPER OF SECRETS'. This is something I believe I will come in contact with many times as I begin working with the Crones. There are two very wise spirit animals that are considered Keepers of the Secrets. One is the Lynx and one is the Raven. The Owl is also related to secrets or the darkness of things. None of these are bad as Creator only created good things for us." I felt such strong emotions reading Heidi's story and request. It's stories like these that remind me of the power of the doll. How many times have we seen children talking with focus and emotion with their dolls? It is no wonder that many therapists and counsellors work with dolls when healing trauma. I felt a big responsibility to make her such a powerful vessel to hold all of these shadow stories but more than anything else I felt excited and very focussed. The first question I asked the doll was who walked with her and it was clear - it was Raven. I began to lay out the silky black feathers. I thought about the doll's body and how strong she had to be - an anchor. I prepared a medicine bundle filled it with mugwort, fern roots, hawthorn flowers and peridot crystals from the Australian desert. I placed a drop of water gathered from the natural spring at the Equinox in the centre of the bundle. Everything about RavenKeeper of Secrets asked for the best. A medicine doll that was being requested so selflessly and who would be in service to so many received the finest fibres of angora, cashmere, merino and silk. Her hair is woven with Camel fibres and dyed with walnuts. And then I remembered a beautiful glass bottle from my own personal medicine bag that held the sacred waters from the Chalice Well at Glastonbury. To these waters I added an oil blend gifted to me by a wise crone here in Australia for protection and healing and saw that this was a vessel to catch the tears as the stories were shared with the doll. And that she would hold the story for them until they felt strong enough to share it with someone who could be trusted. And finally I decorated RavenKeeper's heart with silk rays of blue light around a labradorite that I only realised much later was in the shape of a tear that looked like it was falling into the glass bottle. This stone was also one of the finest in my possession and had been gifted to me. In 6 months time I will journey again across the ocean to gather with my sisters under the redwood trees at Spirit Weavers Gathering. I look forward to hugging Heidi again and thanking her for honouring me with the opportunity to weave such a sacred doll. I look forward to holding RavenKeeper of Secrets again too and feeling how huge her heart has grown holding all those stories. "Originally Artemis herself was a deer, and she is the goddess who kills deer; the two are dual aspects of the same being. Life is killing life all the time, and so the goddess kills herself in the sacrifice of her own animal." Sometimes we consciously track the sightings of our animal allies and sometimes they track us. I believe we have a family of animal guardians that make their presence known to us in many different ways. For myself, it is often in dreams but today as I prepared to write this letter as dedication to the medicine of Deer, I was amazed to realise just how much help and assistance Deer has been giving me all these years. I believe there is no right or wrong perception of an animal's medicine or message - it is very personal for each of us and so I can only share how the Deer shows up in my life and perhaps this will resonate for you too. I also want to share the medicine workings of a beautiful weaver who is working constantly with the spirit of Deer: Lindsy Richards. I feel that together we can find a common thread. The first words that come to me when I think of Deer medicine are strength, grounding, intuition and sensitivity. Deer has taught me more than another animal that I need to be grounded to do intuitive work. It assisted me in creating my work and supporting myself financially through my art but only after I learnt the toughest lesson of just how dangerous it is for me to be in work environments that are damaging to my spirit. For me to talk honestly about this medicine and I understand now that Deer requires me to be truthful is to acknowledge the shadow. Recently someone commented that they hoped I was alright after reading one of my newsletters. I kind of had a little chuckle to myself - I am ok but if I just projected one side of my life where everything was light and easy that wouldn't be the truth and it wouldn't be natural. If I inspire or encourage anyone to embrace a creative life, I need to do it honestly and talk about the pitfalls as well as the heights. I think our society and media especially are interested in only presenting the light. But is it light if it is false? The cycle of nature that we get to observe so closely in the forest is always a balance between life and death. The Deer is one of the only animals where the females also grow antlers but these antlers are grown and then shed every year. The biggest lessons I have learnt from Deer is the balance between freedom and discipline (limitation) and independence and responsibility - when in balance beauty is created. So this medicine more than any other for me is about maturity and being healthy as I stand with one foot in the mundane world and one in the spirit world. When I do this it's as if my spirit grows antlers and I can then use them like antennae to receive messages and dreaming. When I spoke to Lindsy there were many threads connecting us in our work but I was surprised to learn that the deepest thread was that the Deer and antlered women had come to us after a period of illness and breakdown - a kind of psychic and emotional rupture that made it impossible for us to keep trying to live in a way that wasn't truthful and authentic. In my mid thirties I was burnt out. I had spent most of my life in fight or flight mode and working in environments that were way too harsh for me and making me very unhappy. But I thought this is just what you did - you had to survive and support yourself right? Well my body soon told me who was really in charge. I got very sick and everything I was trying to hold onto and keep together fell apart - much like the Tower card in the Tarot. But something interesting happens when you hit rock bottom - you lose your ego and realise there's nothing left to lose so why not do what you love? I had to find my joy again and when I thought of where it lay it was always with reading the Tarot. I began to dream up Sacred Familiar - a name in dedication to my beloved animal companions and so it is not really surprising that it was Artemis who began to show herself to me - the guardian of animals, women and children. I began to surround myself with imagery of Artemis and the Deer and for the first time in m life began to create my own work doing what I loved. At the same time as working purely in an intuitive field, I was managing a business, doing my own accounts and administration for courses. I have no doubt that it was the medicine of Deer that was helping me to navigate and create balance between these feminine and masculine traits. And I began to thrive. My first ever physical encounter with a deer was when I leading a morning meditation walk at my first retreat in Warburton, Victoria back in 2009. I had chosen this area seemingly at random - little did I know I would be returning every month in the future to draw water from the natural spring. This was the first retreat I had ever held and a week before it was to begin, my father had a life threatening stroke and almost died. I had to fly to Tasmania to now be his voice as he had lost his power of speech and mobility. Suddenly I was the adult and was filling out and signing forms I could barely understand. I flew back to Melbourne and the next day I began the retreat. I was in a daze but felt strangely calm. On the second day we woke early and went for a walk in the mist along the Yarra River. We heard an unfamiliar sound and looked up to see a stag and doe running through the front yards of houses along the street. It was a surreal moment to say the least especially as we had been talking about the Empress and the Emperor in the Tarot and now here they were presenting themselves. Just as quickly they disappeared from sight. To see these mythical creatures, not native to Australia, in the daylight, jumping the fences of suburban homes had a strange effect - it was at once magical and at the same time very, very familiar. That whole retreat was a graceful and easy experience and one I will never forget. My next encounter with deer was soon after we moved to Sherbrooke Forest 3 years ago. The forest called and we answered but living here was another matter entirely. We soon began to hear stories from the locals of the wild deer and stag being sighted in the winter evenings. I felt that strange tug again in my tummy - a memory that I couldn't quite catch... At night I was beginning what would become my medicine doll apprenticeship and one of the very first dolls I made was a doll I called StagWoman. You can see her in the photo below and at the top of this post you will see the incredible drawing of StagWoman by Alice Savage who is now the doll's keeper. I made the first StagWoman (who actually lives inside Alice's StagWoman - a doll within a doll!) for myself to help me get used to living in the forest after living in cities for more than half my life. At night I would feel the heavy darkness and the movement of the animals and I felt the forest like a wild creature - Stag at my window. I was feeling old fears that I couldn't even believe I had - they felt somewhat medieval. My fear was of leaving the city or town - I worried about how to fend for myself, how to work for myself and how to survive when all of my clients lived in the city. As I was making this doll, a huge mountain ash tree fell a few metres from our home with a ground shaking explosion, sounding exactly like a car crash in the middle of the night. The next day I went and stood near the upturned roots of this fallen giant trying to come to terms with all this uncontrollable wildness - it all felt so dangerous. 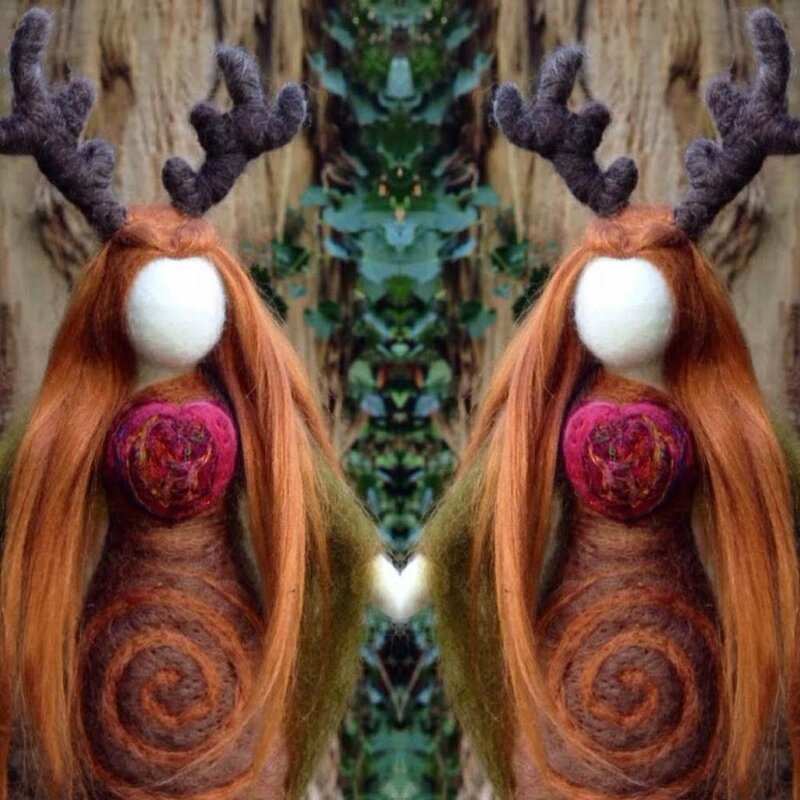 As the doll grew I kept seeing antlers like the Stag growing through her hair. I was confused at first, was she male or female? She told me she was female but wore antlers. She was embodying both male and female and I let her be just that. She became an important talisman to help me find my own balance and to trust the wild that was not only all around us but also waking up inside me. Little by little I lost my fear of the forest and realised it wasn't actually even my fear but something like a bad spell or brainwashing put upon us to convince us that we need the city to survive or others to provide for us. I had to develop totally new habits and ways of working and as I did, the requests for medicine dolls grew. I now felt the spirit of the forest as a soft and caring presence who nurtured me but also confronted me when I was not being aware of nature and she would remind me to always live with nature instead of beside it or hidden inside my so called 'safe' home. I learnt that the forest is safety. The medicine dolls soon become my main source of work - work that I love and adore. And StagWoman keeps making herself known to me constantly through various different medicine doll incarnations. You can see some of them here. Deer medicine is teaching me. And it keeps returning when I need reminding - like it's time to grow a new set of antlers. The lessons are about independence, freedom, living closer to nature and supporting myself to be here. The significance of the StagWoman is to clear and remove old beliefs around gender and what it means to be a woman living in this time now - how to be remain wild and at the same time take proper care of ourselves - to be free and responsible for ourselves at the same time. I met Lindsy when she attended one of my medicine doll circles at Spirit Weavers in the Redwoods this year. I remember her so well because she made the most amazing Marie Antoinette medicine doll complete with gown and white cotton candy wig. When I returned home to Australia Lindsy and I connected through instagram and when I saw the images of what she creates I was blown away. Through her work with Illuminating Archetypes, Lindsy is the creator of the most captivating and fascinating headdresses - many of them antlered. She told me how it was seeing one of my antlered medicine dolls that made her want to make her own medicine doll. We have since had a couple of discussions weaving the threads that connect our work and our own healing, discovering that it was the antlered women and Artemis that helped us to heal and grow forward. I felt I truly understood Lindsy best when I read her story The Artist Mother - A Tale of a 'Wild Woman Archetype' on her website. It's such a strong Deer medicine and Artemis tale! All the animals of the forest are under Artemis's protection. She is in such intimate relationship with them, she knows their rhythms, cycles, and habits. Yet as the huntress she must engage the primordial dance of kill and be killed. Artemis imagery is most often depicted with the deer/stag. She is a death/rebirth goddess. One who holds the mysteries of regeneration and cycles. Artemis and Deer Wisdom: Be still and silent in developing your intuition. Trust your instincts and move swiftly. Approach your challenges with grace and determination." I urge you to have a deeper look at Lindsy's work at Illuminating Archetypes to be taken to the realm of Deer medicine and I look forward to weaving more with Lindsy in the future!